Herbs have therapeutic benefits. Chamomile is a soothing, relaxing herb. Peppermint soothes the digestive tract and aids in heartburn and indigestion. Herbal teas allow you to extract the key nutrients and benefits of the underlying herbs used. Herbal teas are easy to make, relatively inexpensive, caffeine-free and effective. Katie at WellnessMama shares a list of 10 Health Boosting Herbal Teas. She details the health benefits of each tea and provides different information about how to prepare the teas. Some of the teas are blends. 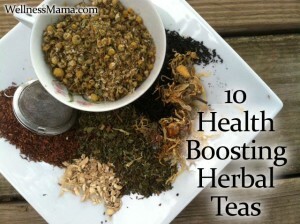 Click the 10 Health Boosting Herbal Tea Recipes link below to see all 10 herbal tea recipes.